William Shatner (b. 1931) was born in Montreal to a Jewish family with Eastern European ancestry. 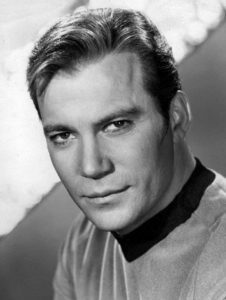 Despite studying economics at McGill University, Shatner was drawn to acting from a young age and was a member of the Montreal Children’s Theatre. After graduating, he became the manager of a theatre company and soon started acting himself in Ottawa’s Canadian National Repertory Theatre and Stratford’s Shakespeare Festival. Meanwhile, he had a few small roles in Canadian films before starring in The Brothers Karamazov in 1958 – his first significant Hollywood role. Over the following few years, Shatner struggled to find more success, and picked up whatever roles he could, appearing on Broadway, in a number of television shows, and various films. In 1966, Shatner was cast as Captain Kirk on the new show Star Trek. In one historic 1968 episode, Kirk kissed Lt. Uhura – the first kiss between a white man and a black woman on American television. Unfortunately, Star Trek was not yet very popular, and the show was cancelled after just three seasons. Shatner had a tough time finding work afterwards, and ended up broke and living from his truck. He took on many small roles through the 70s, appearing in multiple shows and doing all sorts of commercials, from General Motors to Canada’s Loblaws grocery store. By the end of the 1970s, Star Trek had made a comeback and developed a massive cult following. Paramount decided to make a film and cast the original actors in the 1979 Star Trek: The Motion Picture. Shatner went on to play Kirk in six more Star Trek films. He soon expanded to directing films, producing music, writing screenplays, and co-writing a series of very popular sci-fi novels. Between 1994 and 2010, Shatner was the CEO of a special effects studio, while also publishing a number of non-fiction books and continuing to play small roles in film and television. All in all, Shatner has appeared in at least 20 films, 30 television shows, and wrote or co-wrote over 40 books. He has won an Emmy and a Golden Globe, and has a star on both Hollywood’s and Canada’s Walk of Fame. He has played for charitable causes on the World Poker Tour, and is an organizer of the Hollywood Charity Horse Show which raises funds for children’s charities. In 2006, he sold his kidney stone for $25,000 and raised an additional $20,000 to build a house with Habitat for Humanity. Interestingly, Shatner does not like seeing himself on video, and says he has never watched any of his films or Star Trek episodes! God is a circle whose center is everywhere, and whose circumference is nowhere. This entry was posted in Arts & Entertainment and tagged Canadian Jews, Captain Kirk, CEO, Charity, Emmy Award, Film, Golden Globes, Habitat for Humanity, Hollywood, McGill University, Montreal, Ottawa, Philanthropists, Science Fiction, Shakespeare, Star Trek, Stratford, Television, Walk of Fame, World Poker Tour on July 21, 2016 by Jew of the Week.